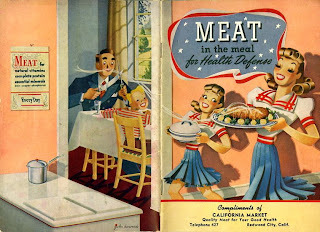 Printed in 1942 by the National Live Stock and Meat Board. While on the subject of grilling, I’ll share Great Grandpa William Levy’s famous steak recipe. Bill Levy was a fastidious and rich man, who once owned his very own island in New York’s Thousand Islands. (A fact that amazes my children.) As a child, he color-coded his sock drawer. When he grew up, he required his family to wipe the dock dry of all wet footprints, and fluff the grass after sitting on it. But by the time I met this man he was old and thin, and the only thing he demanded of his family was that he be able to watch his football uninterrupted and his martini be served dry, at 5 p.m., sharp. Take 2-inch-thick New York strip steaks, cover them with a thick crust of Jane’s Krazy Mixed-Up Salt, sear over hot coals and then move to medium coals to finish. When done to preference, slice thinly.